Well it’s December 1st and I guess with just over three weeks to go, it’s about time to start thinking about Christmas dinner recipes. In the past few years there have been several christmas campaigns run by different supermarkets and companies which have made it look like christmas is a huge chore, and that mum has to run around preparing a roast turkey dinner for the family which seems to take a gargantuan amount of effort. I have to say I’ve never really seen cooking a roast dinner in that same way, in fact I think that just a bit of planning and preparation a roast dinner can be one of the easiest meals to make. Whether you are cooking Christmas lunch for 2 or 20 people the basics are the same, timing. Get this worked out and everything else will fall into place. I think that Christmas dinner doesn’t have to be full of hassle, after all who wants to be stuck in the kitchen for half of Christmas day when you could be with the family, looking at presents and joining in with the fun. When planning Christmas lunch most of us start with the traditional roast turkey and go from there. Personally I’m not a big fan of roast turkey. I find it lacks the flavour you can get from chicken and more often than not when I have had it either at relatives or in restaurants for Christmas it’s ended up being dry and overcooked, so why do we have to have turkey for Christmas? The first change I’d suggest is looking at alternatives such as chicken and beef, both great options, but the recipe I am going to look at here is for a lovely roast chicken. I have chosen this recipe as it is easy to cook and won’t require too much work. If you are looking for a tasty Christmas lunch recipe, this is the one to go for. 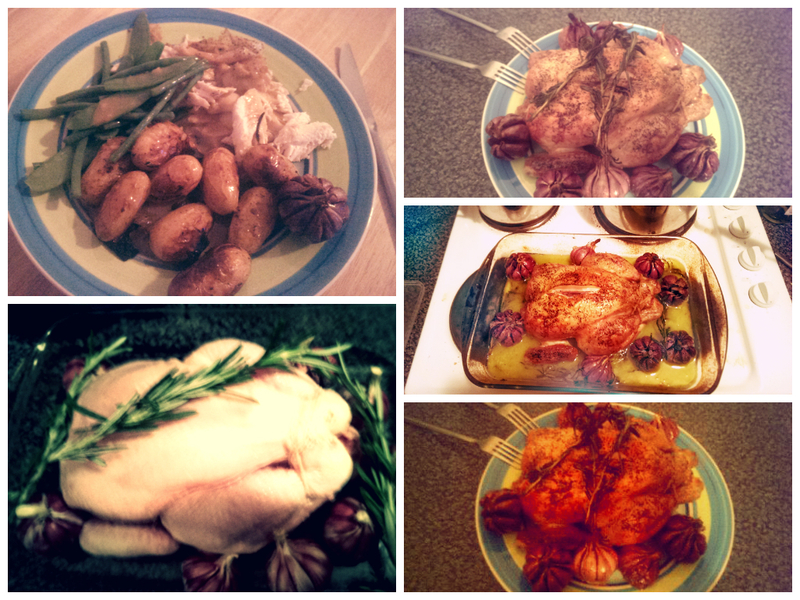 This Christmas dinner is based on what I think is either a French or Italian recipe, Chicken with 40 cloves of garlic. 40 cloves of garlic might sound like overkill and put a lot of people off. When you roast a bulb of garlic whole and slowly it releases a gentle and sweet flavour which is almost nothing like the harsh taste you can often get from garlic. I know this is not a traditional ‘Christmas recipe’ but it does make a really nice roast chicken with a wonderful wintery flavour. 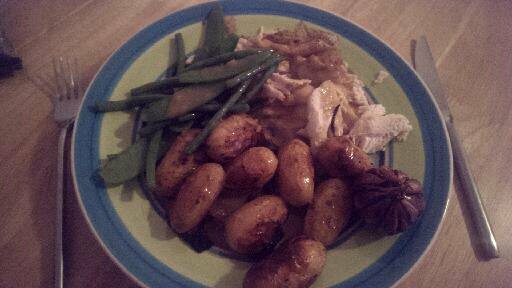 When Hana made this recently, she served it with roast new potatoes, fine green beans, mange tout and a homemade gravy which uses the juices from the roast chicken. We had this for the first time a couple of weeks ago and I thought at the time that it would make a lovely Christmas meal. So without further ado, here is my first suggestion for Christmas dinner. *we used Vermouth for this recipe. Begin by preheating the oven to 200c/ gas mark 6. Pop the chicken into a casserole or roasting dish. 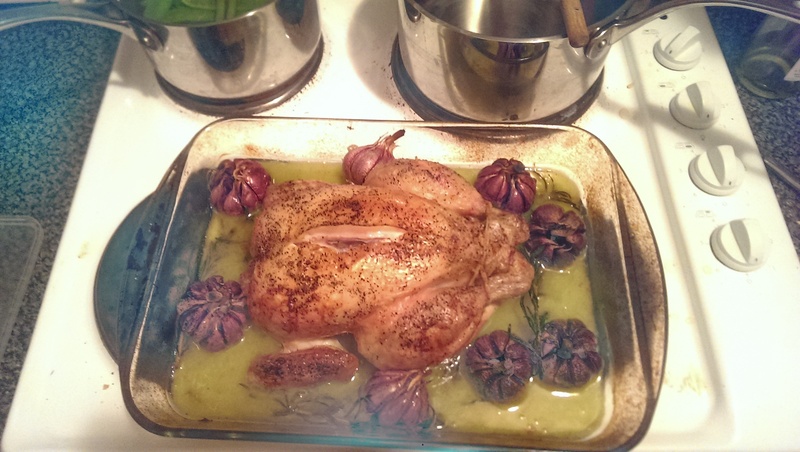 Place the whole garlic bulbs around the chicken. Liberally pour over some olive oil to coat the chicken and garlic. 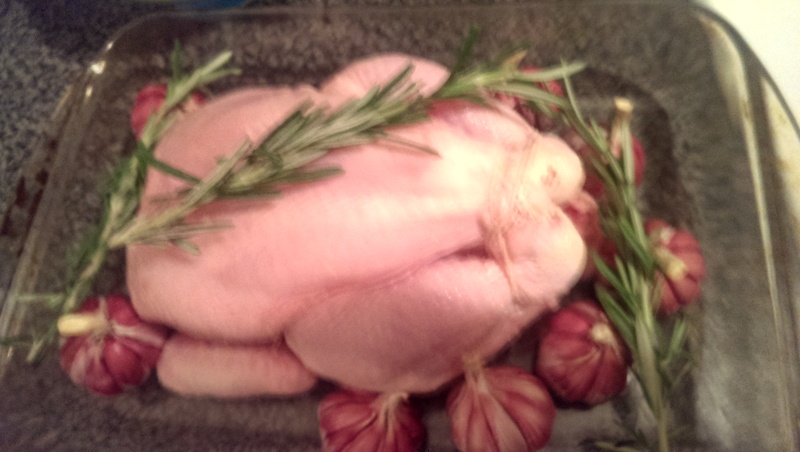 Sprinkle the chicken with thyme and dress with the sprigs of rosemary. Season with salt and pepper to taste, a bit more salt will crisp up the chicken skin more. Bake, uncovered, for 1 ½ hours, set a timer for 1 hour 45 minutes leaving you with 15 minutes for the chicken to rest after cooking before serving the roast. Next go and relax for 45 minutes or so, seriously – nothing else to do for now. After 45 minutes go back to the kitchen and add the vermouth or white wine to the chicken. Put on a pan of water to boil. You need one large enough to hold the potatoes. Boil the potatoes for 5 minutes. In the meantime put a second roasting dish in the over with a good glug of olive oil, enough to cover the bottom. After 5 minutes drain the potatoes and when your clock says 1 hour to go, take the heated roasting tray from the oven and add the potatoes. a few cloves of garlic and the 2 sprigs of rosemary. Stir the potatoes to coat in the hot oil and pop back in the middle of the oven, if you don’t have enough room for the chicken and potatoes in the oven, put the chicken lower and potatoes higher. You should have an hour to go on your timer. After 30 minutes turn the potatoes, by now they should be becoming golden. Wash the vegetables and get ready to boil them. When the chicken has had its 1 hour 45 minutes remove from the oven. 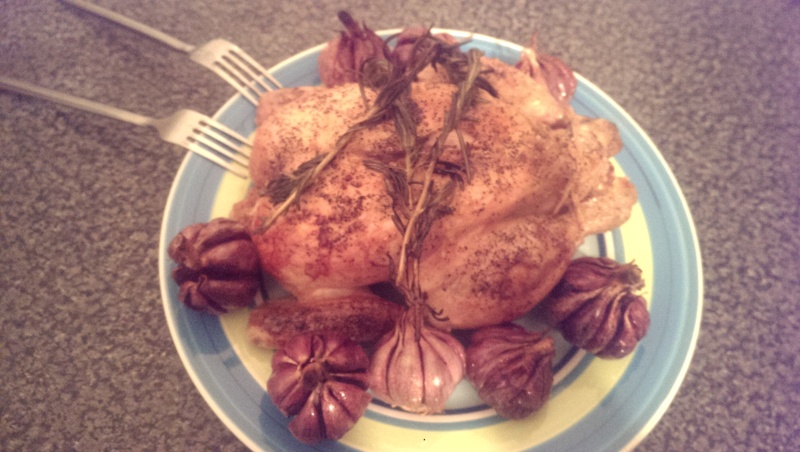 Pop the chicken and garlic on to a chopping board to rest before carving. Put a pan of water on to boil, ready to cook the vegetables, when boiling add them for around 5 minutes then drain. Squeeze a few of the garlic cloves into the roasting dish which contains the juices from the chicken, squash them into the liquid. Boil a kettle and prepare the vegetable stock according to its instructions. Put the roasting dish on a hob and gradually bring to a gentle simmer. Add around 100ml of the stock and stir. As it begins to simmer add the flour and whisk continuously and vigorously. You need to keep whisking else the flour will clump together. You can adjust the thickness of the gravy by adding more stock to thin it and more flour thicken to reach your desired consistency. Everything should be ready. Take the potatoes out of the oven. Carve the chicken and serve everyone with a generous portion of chicken, potatoes and vegetables with lots of tasty homemade gravy. I hope you found this christmas dinner recipe useful. I will be sharing more Christmas dinner and food related gift ideas through December.